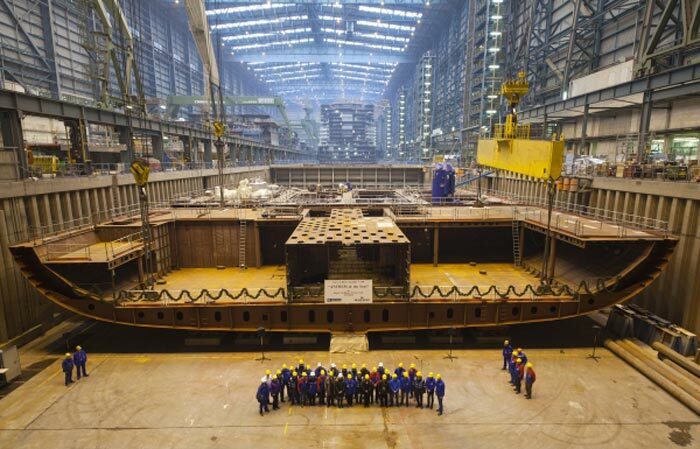 Royal Caribbean have today announced that the second Quantum class cruise ship Anthem of the Seas has reached a construction milestone. The upcoming ship has had it’s keel lowered into place. The process marks the step of the actual construction process where all the different blocks of the ship will come together to make it whole. There was a ceremony to celebrate the keel laying. A 620-ton block was lifted by a large 800-ton crane which started the physical build process of the Anthem of the Seas. Now more block will be added and the ship will start to take shape. Anthem of the Seas will be the second ship in the Quantum class and will be 167,800 tons just like it;s sister ship Quantum of the Seas. The ship will carry 4,180-t0n passengers and 16 decks. The ship is set to bring even more innovative features the the Royal Caribbean fleet including the North Star where guests will be able to get amazing views 300 feet above the ship. Anthem of the Seas will launch in Spring 2015 and cost $950 Million to build. So who is excited about Anthem of the Seas? Let us know in the comments below.